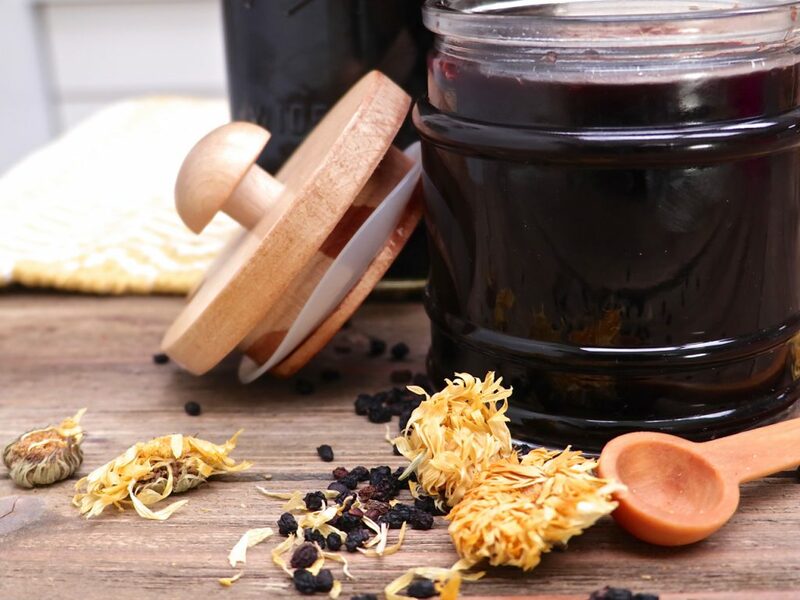 Watch me make this homemade elderberry syrup from start to finish! NOTE: I am NOT a doctor. Be sure to talk to your doctor before taking natural medicines or vitamins, as they may interfere with current medications. It’s almost that time of year again….back to school time!!! Actually, a few schools around here have already started! Like…didn’t school just let out a few weeks ago??? I’m not complaining though because for me there is no back to school. My homeschool is always in session and sometimes I secretly want to ship these rowdy boys off to public school. Lord take the wheel and drive me to the ABC STORE!!! Yeah, it’s been one of those days hahaha but I love it! Even though my kids aren’t in school that doesn’t mean that they’re exempt from one of the dreaded back to school problems…COLDS!!! My boys are involved in a lot of extra curriculum activities and they sometimes bring back a cold or two. At the first sign of a cold, I whip out ELDERBERRY SYRUP!!! Isaac runs from it. Ethan does pretend coughs just so he can have some. I swear those two are night and day. 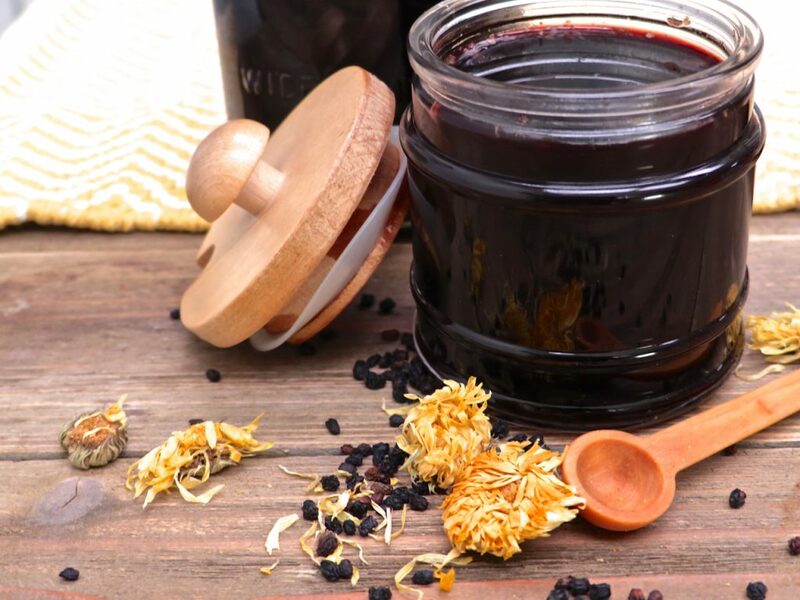 Elderberry syrup is like the King Mac Daddy of homemade, natural cold and flu fighters. Liquid medicinal gold of the Gods!!! We’ve been a semi-natural family for many years now. I grew up this way and people are usually pretty surprised when I tell them I’m not vegan. I guess they expect me to be natural with food since I’m so granola with everything else! NOPE, not happening sister!! I need my meat, fats, butter, sugars and salts!! You feel me? 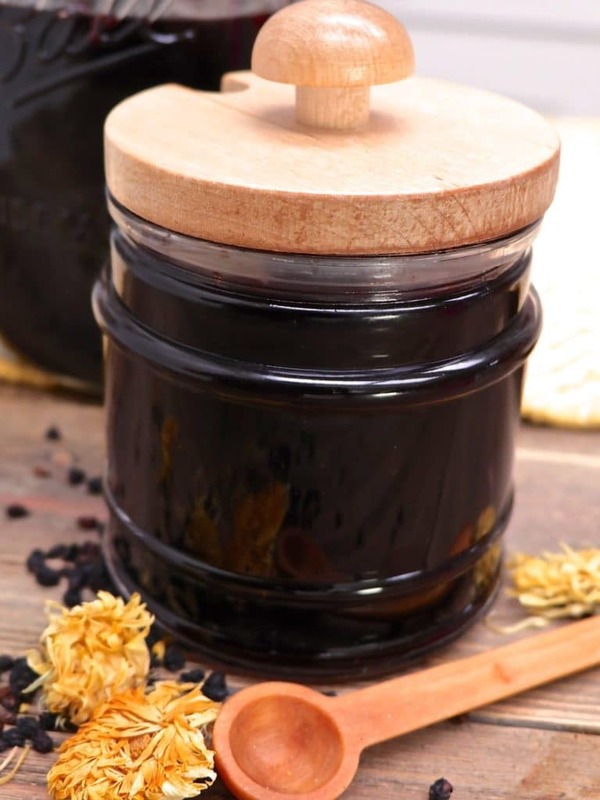 I’ve been making and using this Elderberry syrup recipe for years and I swear by it!! I discovered the recipe in a book I love called Herbal Recipes for Vibrant Health by Rosemary Glasdsar and I’ve since tweaked the recipe to include a few more cold-flu fighting ingredients like apple cider vinegar, fresh lemon and a blend of teas. Gosh, I love teas but you can totally leave them out! This stuff is AMAZING either way!!! I’ve pretty much got my whole family singing its praises! I’ve only used it to fight or prevent colds and flu but I hear it’s also good for body aches and allergies. Fire up the google and discover all the great benefits of elderberry! What are Elderberries & what is elderberry used for? What the proper dosage for Elderberry Syrup? This is the regimen I use to keep colds at bay in my family. I spring into action at the first sign of a cold and it usually nips it in the bud or lessens the intensity. Before bed, rub wild oil of oregano on the soles of foot and 1 drop diluted with carrier oil under the tongue. Diffuse a mixture of eucalyptus, lemon, tea tree, and peppermint oil throughout the day and at night. I get my dried Organic Elderberries from Amazon but you should be able to get them in whole food stores as well. It can be pretty pricey but it lasts for a long time. Here is the kind I get. As you can see, it’s really easy to make and last a long time. I store mine in the fridge and it lasts all fall and winter. ******RECIPE CHANGE****** Since this post, I’ve tweaked this recipe to make it more kid-friendly in taste. This is the recipe I use now. In a large saucepan add elderberries and 3 cups water. Simmer for 30-40 minutes or until liquid reduces by half. Use a masher and mash the berries. Strain into a large bowl. Set aside. Steep tea for 10-15 minutes and add to elderberry mixture. 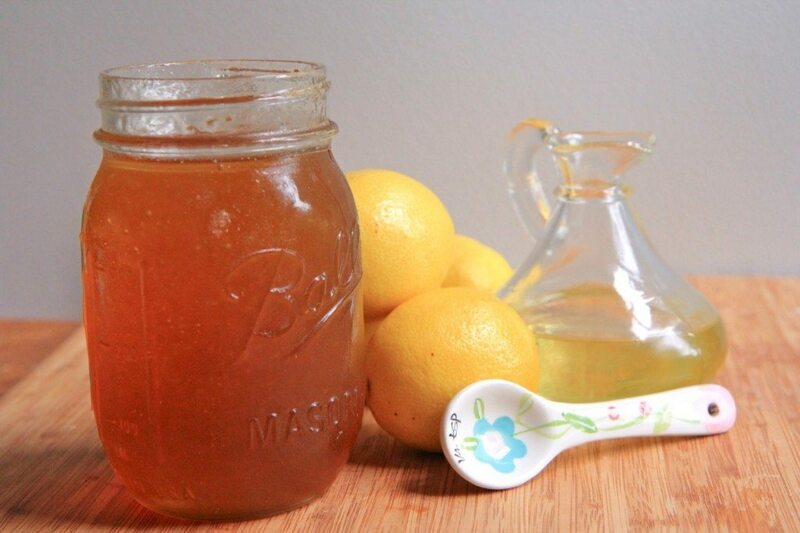 Once cooled slightly, stir in honey, apple cider vinegar, and lemon juice until honey is well incorporated. Taste and add more honey or lemon to suit your taste. Take 1 tablespoon daily or at the sign of a cold. Take 2-3 times a day once a cold has set in. * For the tea, use a blend that is for cold & flu. I used Triple Leaf Cold & Flu and an Echinacea plus blend. Love this recipe? 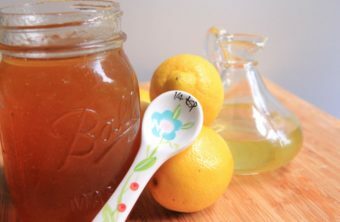 Try Grandma Barb’s Homemade Cough Syrup! I want to know about the container please. Where did you purchase it? Hi! Can’t wait to try this. Currently we use the gummies. Can you re-post the link that you get the elderberry from? I don’t see it in the recipe.